Louie, a 68 pound Mixed Breed finds this elegant Jules Sofa to be the perfect place to lounge in style. Designed with a curved, channel quilted back to evoke a sense of cozy, secure comfort, it also features embossed Ultra Plush fabric with silver metallic, faux-leather trim. 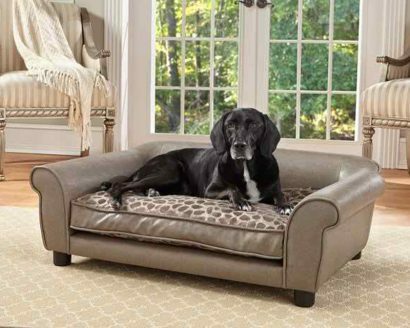 The Jules Sofa is just right for those pets who love to curl or lean while sleeping. Summer is an elegant 70 pound Boxer who loves her Wentworth Sofa to lounge on. 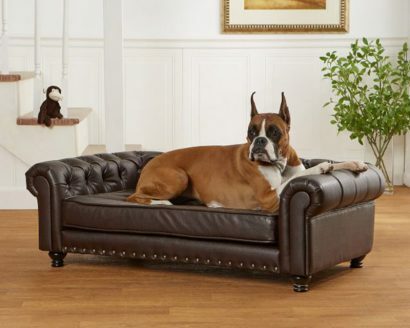 The Wentworth is a stately, generously tufted pet sofa, upholstered in fine quality, pebble grain faux-leather. It boasts a classic, tufted, rolled-arm and muted, brass tone nailhead detail. Made with durable, furniture-grade construction and a sturdy foam cushion, it suits medium to large pets who like to lean while resting. Jewel, a 45 pound Labrador mix clearly feels at home on this high quality, faux-leather pet sofa with its soft and plush, embossed micro-velvet cushion. Low profile, rolled arms offer a perfect spot for dogs who love to lean while sleeping. 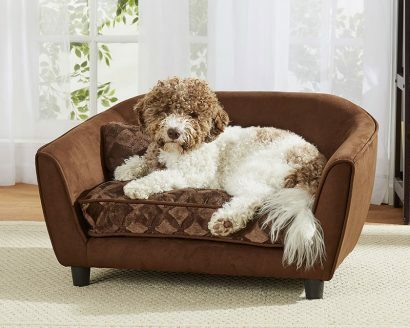 Meet Ollie, a 30 pound Italian Waterdog, looking lovable on this Astro Sofa. The perfect Ultra-Plush sofa with embossed micro-velvet seat cushion and matching pillow, it is just right for pets up to 50 pounds who love to sleep curled up.